This post is a tribute to a fantastic educator and colleague, Earle Holt. Earle is retiring from Heim Middle School after a 43 year career. His last day is December 23, 2010. Earle has touched so many lives in so many ways. Most importantly, as an art teacher he has had a great impact on thousands of students who have come through our school. One hallmark of Earle’s work is the wall block, and more recently, wall tile. 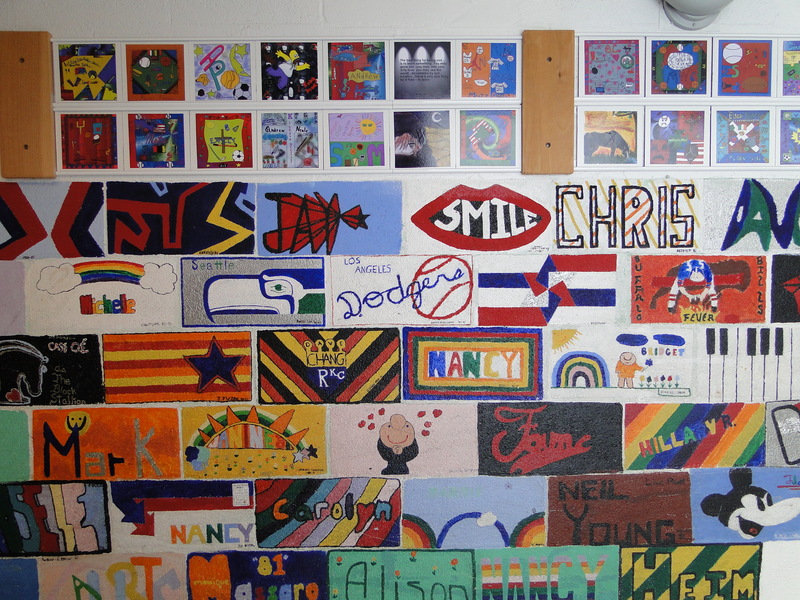 Every 7th grade student for the last 43 years has created a personal reflection of themselves or something important to them, and either painted it on the wall or created it on the computer and had it mounted on the wall. 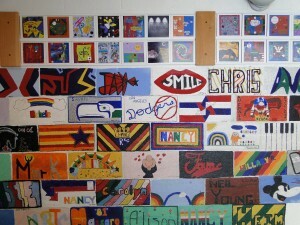 There are over 12,500 individual pieces of art, all created by students. There are many instances where parents and their children have shared the same experience creating a wall block/wall tile while they attended Heim. On any given day you might find an adult scanning the walls to find their work of art from years ago. I first worked with Earle when I arrived at Heim to help solve a problem – no more room to paint on the walls. We came up with a plan (actually he had the plan and I just helped get the technical kinks worked out) to have students draw their design, scan it, and finish creating it using paint software. The printed design is heat laminated to tile, then mounted on the wall (closer to the ceiling, above the painted wall blocks). The transition from painted wall blocks to scanned/printed/laminated wall tile was fascinating, and a great success. More than this particular project, though, is working with and observing Earle when he works with students. He has such a nurturing and warm style, and he truly cares about each and every one of the students. I have worked with him in his classroom regularly over the years. Recently in light of his retirement, I’ve tried to pay a few extra visits. His classroom environment is quite remarkable. His “corner of the world” has also been known as the place to get a cup of coffee, tea, and tasty treat whenever a break is needed. You always leave his room with a smile or a laugh. His warm, welcoming style reverberates with staff and students alike. I put together a brief slide show below as a tribute to a great person. Earle will be missed, but he deserves all the best that retirement has to offer. A wonderful tribute to one fantastic educator!! Thank you Earle for all that you have done for the students, faculty and families of Heim Middle School, and especially for all that you have done for me throughout the years!! All the best to you in your new adventure!! Your passion for thinking, and your commitment to understand the human condition are simply unmatched… You are a master potter, a master educator, and a wonderful human being (not necessarily in that order). Wishing you a retirement filled with great joy! Congratulations on a well deserved retirement and thank you for making a difference in all of our lives! Does anyone know how to get in touch with Mr. Holt? I can send your email address to him Erik. Previous Previous post: Web Literacy 101: Look Up!